They have four books in development. An alien takes over the body of a 16-year-old bully and must face the challenges of being a stranger in a foreign land, plus the consequences of a life she didn't live. Star Wars’ Moving Target writer Cecil Castellucci and artist Marley Zarcone explore themes of madness, alienation, and the bizarre in this sci-fi thriller, with covers by Becky Cloonan. The new series hits shelves in October. Writers Gerard Way and Jon Rivera, along with artist Michael Avon Oeming take readers on a strange adventure with DC Comics’ Silver Age character Cave Carson, his cybernetic eye and his college–age daughter as they travel to dark places deep in the earth and mind. Catch this new series in October. Meet Violet Paige, a celebrity heiress by day and brutal vigilante by night as she takes on the underbelly of Gotham City’s high society. Hitting shelves in November, the series is written by Gerard Way and Jody Houser with art by Tommy Lee Edwards. DC is doing something they haven't done since 1985's "DC Challenge"
They are doing a Challenge centered on Kamandi The Last Boy on Earth. 24 Artist and Writers break off in 12 teams to take turns writing one cohesive story round robin style. It is Free Comic Book Day in the US maybe other places. I was able to get 6 free books. I purchased DC Universe Rebirth #1. It was great I can't wait to read more. Those were sold out this past Wednesday. Do comics companies do like a one year edition which has all the comics that release every month for a particular title over the course of one year? I'm not sure. I do know they have trade paper backs of one particular story that releases after that storyline wraps up. I wish they would just do one book a year with all the issues from one title. Assuming there is a new comic every month. Would make collecting so much easier. Some books are monthly but most of the Rebirth books are biweekly. Green Arrow and Superman got damaged in shipping so my local store couldn't sell them. I also got Action Comics #958 and Detective Comics #935 in June. I got three DC Rebirth books yesterday. Soon I will have to decide which books I want to keep reading because they are releasing a lot of books each week good thing some of them are Monthly instead of Biweekly. Looking foward to the Young Animals line from DC Comics. Each book will be in the DC Universe loosely. Mother Panic is set in Gotham and will reference some of the other DC characters but it would be similar to old Vertigo when they had DC characters and was loosely connected to the DC Universe but would mainly just interact with each other. Doom Patrol launches on September 14th. Shade and Cave Carson launch in October. Mother Panic launches in November. 10.29 million been shipped to comic book shops in North America in the month of August. The last time shops ordered that many comics was in December of 1996. It is a combination of DC Rebirth being successful and having multiple comic book movies releasing in the next 4 years. Last Month DC debuted the Young Animal Imprint that was curated by Gerard Way. Today DC announced that Warren Ellis will curate the revival of Wildstorm which will happen in February 2017. This is from a few weeks ago but this would be funny in a movie. 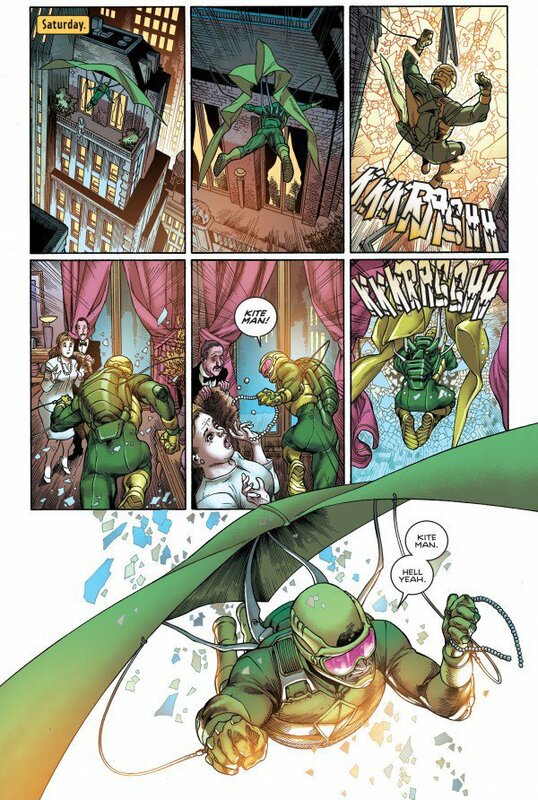 Kite Man's real name is Charles Brown. This is the new team for Justice League of America in the comics! The team wil be Black Canary, Killer Frost, Vixen, The Ray, Atom (Ryan Choi), Batman, and Lobo. DC announces the it's first "New Talent Showcase" of the modern era! Harley Quinn: Good Morning, Gotham! The artist are from the Fall 2015 Artist's Workshop. The writers are from the Spring 2016 Writer's Workshop. The teachers of the workshop are: Klaus Janson, Andy Kubert, Jim Lee and Scott Snyder. Boom Studios, DC Comics, and 20th Century Fox announces a comic's crossover between Green Lantern and Planet of the Apes! February Solicitations for DC Comics! I can't wait for this story arc from Detective Comics! Starting with the 950th issue of Detective Comics Cassandra Cain will have a more prominant role in that story arc starting with that issue because it deals with the League of Assassins and her mother Lady Shiva.